Years ago, when I first learned that knocking fish out could improve their taste, the scientist who sent me my first batch of Aqui-S brand anesthetic told me to try it on lobsters. “Makes ‘em taste better,” she said, and she was right. Over the years, Nils and I performed many side by side taste tests killing lobsters various ways, and the ones we knocked out with clove oil always tasted best –sweeter, cleaner. When tasted side by side, the lobsters killed by simple boiling or steaming had a muddier, dirtier finish on the palate. We also used anesthesia on live Alaskan king crabs on two occasions. They were the best damn crabs I’ve ever had. Still makes me happy to think about them. Last week I performed another series of taste tests –lobsters killed four ways, two lobsters per method, sampled in three triangle tests. Unfortunately, in these tests the lobster-to-lobster taste variations proved as great as any taste variations I could attribute to killing methods. Some lobsters were male, some were female, some clearly had newer shells (these lobsters, called shedders, are less full of meat and taste different from hard-shell lobsters.) I don’t know how long the lobsters were in their retail tank, or if they were from the same shipment. The upshot? I still believe proper lobster-killing technique produces a better product, but those quality improvements are easily swamped by other variables. There are reasons other than taste to avoid haphazardly throwing lobsters into boiling water. I have killed many lobsters, without regret. But there are many, many people who are squeamish about killing lobsters, and about the practice of boiling or steaming alive; for a famous argument see David Foster Wallace’s essay, “Consider the Lobster.” Wallace echoes the sentiments of many (and he didn’t even live to see the recent work on Hermit Crabs showing their ability to learn and make complex choices –facts he would have been interested to report). If you are in the Wallace camp, using alternate lobster-killing techniques can assuage your guilt. A lobster that has been anesthetized sinks to the bottom of a pot of boiling water with nary a tail-flick –like bather into a warm bath. 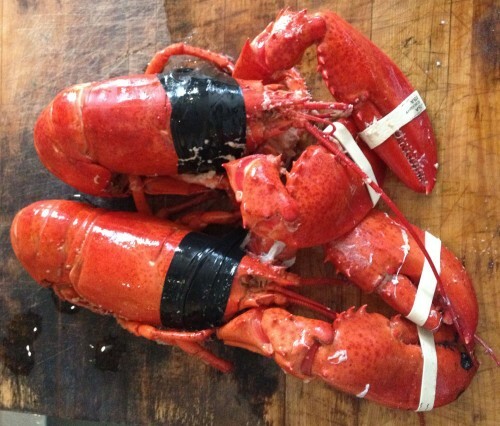 To get you prepped for your 4th, here’s a list of lobster-killing techniques I’ve tried and my thoughts about them, plus a recipe for a fish and lobster anesthetic you can easily make at home. 1. 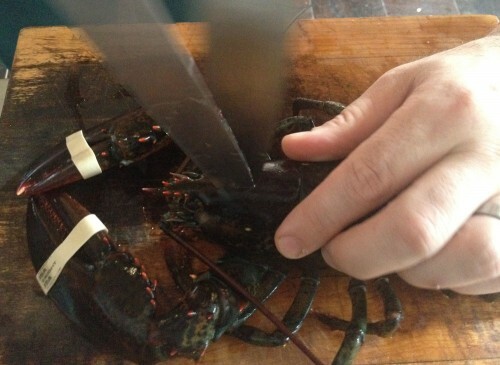 Boiling or Steaming: the standard way, but not the best way, to kill a lobster. The lobster knocks around the pot for quite a while. Dan Ward, then a grad student at the University of New Hampshire, once hooked an electrode up to a Lobster heart for me and boiled it. The heart beat for 1 minute 53 seconds. I’m not saying the lobster felt anything for that long, but I can say for sure that physiologic processes like heartbeat continued long enough for stress-related factors to affect meat quality. 2. Extreme Chilling: which means freezing your live lobster prior to cooking – this technique causes the lobsters to move less (at least initially) but doesn’t affect taste as far as we could tell. 3. Hypnosis Induced by Carapace-Rubbing: I could never get this business to do anything. 4. Electrocution: Years ago a company out of the UK called Crustastun started selling restaurant-scale lobster electrocution equipment; I saw them at a restaurant show. They claimed it made the lobsters taste better and was humane. I couldn’t afford to buy their unit, but I made my own version. Electro-stunning’s effectiveness is determined by species, pulse voltage, effectiveness of conduction, and the frequency, waveform shape, and duration of the electrical pulses. I looked at some lobster stunning patents and it seemed that my standard house voltage (120 volts at 60 cycles, sine wave) was adequate, so I hooked some foam sheets up to a wall socket with a foot-switch, soaked them with sea-water , pressed lobsters between them, and applied electric bursts up to 30 seconds. I wasn’t impressed. I killed the lobsters quickly, but was left a scorch mark on the shell. Even worse, the muscle spasm caused by the shock nearly always caused the tail to separate slightly from the carapace. While the meat didn’t taste worse than normal, we didn’t think it tasted any better either. Plus, this method makes you look like a complete lunatic. If you care about that sort of thing. 5. Knife through the head: Definitely the simplest humane killing method. David Foster Wallace doesn’t think it is a sure-fire road to humane killing because a lobster’s nervous system is decentralized. Shoving a knife into a lobster’s head between its eyes only destroys some of the lobster’s nerve centers, called ganglia, while leaving others intact. The way I do it, however, the head is bisected, destroying many of the ganglia. My theory: If you can seal the lobster after the kill-blow you can preserve the hemolymph and the flavor. As a preliminary test I put a knife hole in a Vitamin Water bottle, F-4-tape- sealed it, filled it with food colored water and boiled it. During a 10 minute boil, I estimate that 22 mls of water were exchanged between the 591 ml bottle and the surrounding water (estimated by color matching experiments). Ok, but not perfect. For the real test, I knifed the lobsters in the head without going all the way through (trying to prevent hemolymph loss), rattled the blade around to knock out as many ganglia as possible, taped the knife holes with F-4 tape, and boiled. You have to move the knife around a lot to destroy all the frontal ganglia. Wrapping with F-4 silicone tape. I had extremely high hopes, which were pretty much dashed. As I mentioned up front, these were flawed and inconclusive. Besides that, a lot of hemolymph was lost on the initial knife push – the lobsters squirted like a fountain. Taping was also a bit harder than I thought it would be. I am not giving up on this technique. Bear with me…more tests are in order. 7: Anesthesia (still the best): Lobsters that have been knocked out prior to killing are sweet and delicious with a very clean, briny finish. Do it right and you can’t taste the anesthetic. The commercial anesthesia of choice is Aqui-S, whose active component is isoeugenol , a constituent of clove oil. Turns out clove oil itself, whose main component is eugenol, is as effective and is readily available at Whole Foods. Clove oil does not mix with water, so it needs to be added to a carrier such as high proof ethanol (190 proof is best, and is legal in most states, but 151 might work). 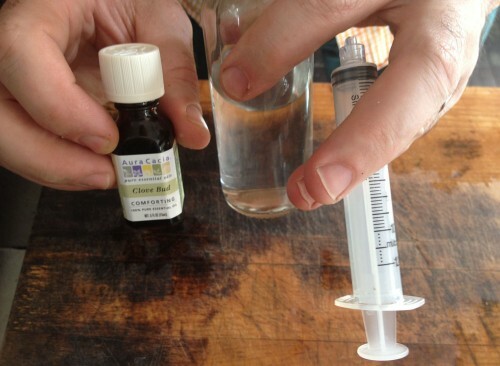 The clove oil that I use comes in 10ml bottles, which I add to 90 ml of ethanol to make 100ml of clove oil solution. Wear gloves when handling the clove oil, or the smell will linger on your person a loooong time (or you can use plastic wrap, like in the picture – I had no gloves on hand). 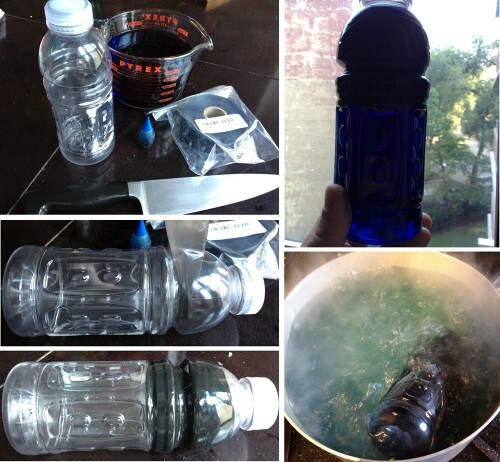 The Water: You need a water bath for this process, and sea water is best. You can use a mixture of kosher salt and water. Chlorine in your water you could kill the lobsters (I think), so I always use hot water (which typically has no chlorine) to dissolve the salt and then chill the hot water with ice — lobsters don’t like warm water . Fridge temp is good. The ocean is approximately 3.2-3.5% salt, so I use about 33 grams of kosher salt per liter of finished solution (0.28 pounds or 4.5 ounces of salt per gallon). I make about 3 gallons for 4 lobsters. The Dose: Aqui-S is about 50 percent isoeugenol. 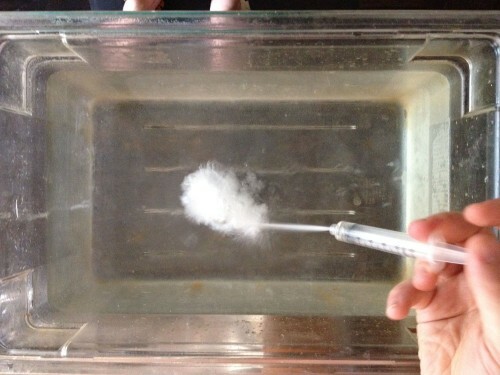 The normal dose for fish is about .06 ml Aqui-S per liter of water, or .03 ml/liter isoeugenol. The clove oil I use says “minimum eugenol content 75%.” Assuming that minimum, every milliliter of my stock clove oil solution has 0.075 ml eugenol. For fish, therefore, use a little under a half milliliter per liter, or 1.5 ml per gallon. 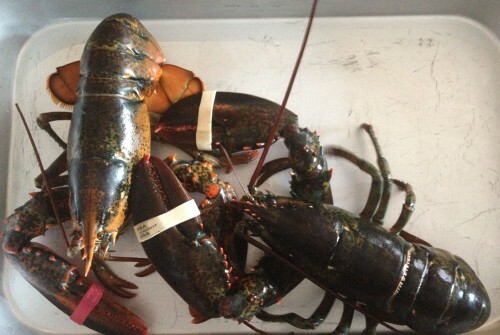 Lobsters don’t knock out as easily as fish do –use a little more, like .53 ml per liter (2 ml per gallon). If that doesn’t work you can always add more. The highest dose I’ve tried is 0.8 ml per liter (3ml/gallon). I’ve had that work perfectly, and I’ve had that dose wipe out the lobster almost instantly. Try not to use too much, or you might taste the clove oil in the lobster. 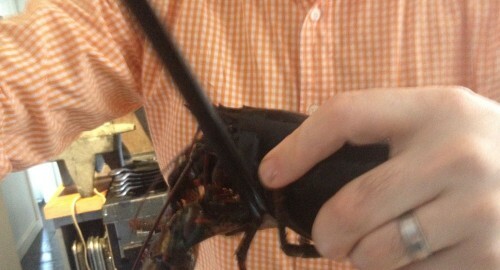 Spray the solution out of a syringe into the lobster water and give a good stir. Expect to get a white, pastis-like cloud. The Knockout: At first you will see nothing. Then the lobsters will show some movement, maybe some tail flicks. Then the lobsters will stop moving and you’ll think they are knocked out. They aren’t. Instead, after a little rest they will start zombie-walking backwards. Pick them up and they will still zombie walk. If they reach the side of the tank they still zombie walk. After the zombie phase, they go slack again. It’s boiling time. A Note on Cooking: At one time I used low temperature cooking on lobster, but I actually like high-temp lobster best . Sorry. It’s great to be an American. Thank you, Dave. Interesting piece. Any thoughts on splitting the lobster in half after anaesthesia and then sauteeing? As a Mainer and a cook I have developed a very successful technique of making a rapid stab and downward slice through the mandibles while the lobster is on it’s back. In a fraction of a second the brain is split and you don’t need tape. 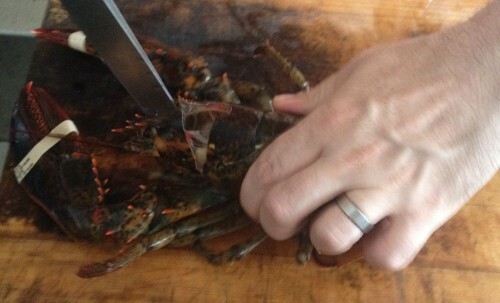 This is typically the first slice you make (the kill) when you split a lobster for broiling or stuffing. I actually tried that the day after my post. Worked well. You do lose less fluid upside down. Haven’t tried any side-by sides yet. Uah – honestly this is the reason I do not eat lobsters. We (humans) have achieved the luxury to breed (or catch) all kinds of animals in order to eat them. Why the hell do we have to torture some of the to death? (I’m not a vegetarion or s.th – I just don’t want to torture an animal to death just for eating it). Yeah. I don’t think you have to be a PETA foundation member to object to boiling animals to death. Would it make any sense to emulsify the clove oil for better dispersion, or does that deactivate it and make it no longer suitable for the purpose of anesthesia? Good question, I’m not sure.